We’ve all seen his tuck in goals against Raanta (shootout), Talbot (Regular season), and Dubnyk (playoffs). Which is already a tough move to pull off espically against some up and coming goalies. But what does the future hold for this young Russian? Tarasenko finished the season with 37 goals and 36 assists, plus his 6 goal and 1 assist playoff run, which is impressive considering he only played 6 games. Remember that this is only his second full season. After his contract ended, Doug Armstrong knew he needed Tarasenko to stay in St. Louis, and they managed to work out a deal, 8 years/60 million dollars. And Tarasenko seems to like St. Louis and is happy playing here; “happy to be with you and carry a note on my chest . 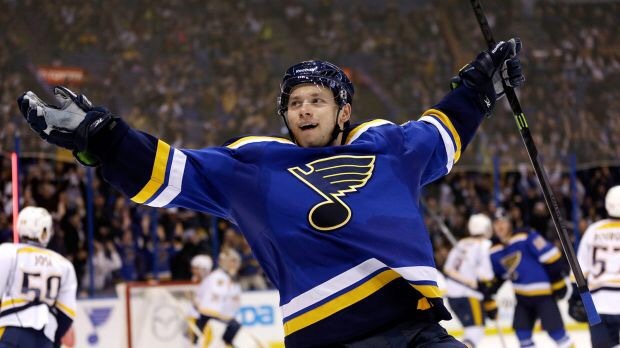 Let’s bring the cup to St.Louis!” he said in a tweet (@tara9191). But will that confidence and up beat attitude translate into success? My personal opinion is yes. Tarasenko will only get better. “He’s only scratched the surface of what he’s capable of.” stated Armstrong in a Town Hall interview. Tarasenko has a lot of skill and says he wants to take on a leadership role, and he wants to be the person his teammates can count on. Him and Lehtera have a lot experience and chemistry, and Jaden Schwartz is a perfect fit to creat the STL line. It is very possible that they will transition from 2nd to 1st line, which will give Tarasenko more ice team meaning more goals. I predict that he will score 40+ goals this 2015-2016 season, translating into his best season yet. What’s your opinion? Be sure to leave a reply and check out The Hockey Scoop for more hockey related articles.